Most high-temperature geothermal reservoirs yield a fluid which is a mixture of steam and liquid brine, both under high pressure (typically up to 10 atmospheres). The steam content, by weight, is between 10% and 50%. The simplest method to exploit such a resource is to separate the steam from the liquid and use the steam alone to drive a steam turbine. However this throws away much of the available energy, particularly where the proportion of steam in the fluid is small. 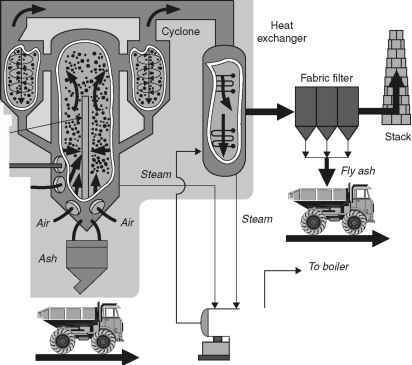 Figure 12.2 A flash-steam geothermal power plant the liquid and used to drive a steam turbine. 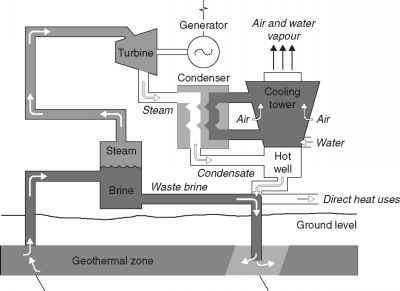 The steam exiting the steam turbine must be treated in exactly the same way as the exhaust from a direct-steam geothermal plant in order to prevent atmospheric pollution. The remaining liquid, meanwhile, must be injected into the geothermal reservoir since it usually contains high levels of dissolved salts which can cause pollution. A further refinement to the flash-steam plant is called double-flash technology. This involves taking the fluid remaining from the first flash process and releasing it into a second vessel at even lower pressure. This results in the production of more steam which can be fed to a second, low-pressure turbine or injected into a later stage of the turbine powered by the steam from the first flash. A double-flash plant can produce up to 25% more power than a single flash plant. 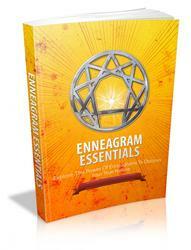 However it is more expensive and may not always be cost effective. Flash technology plants will generally return a much higher percentage of the geothermal fluid - up to 85% for a single flash plant and somewhat less for the double-flash plant - to the geothermal reservoir. This will include most of the dissolved chemicals contained in the original fluid. However some reservoir depletion will still take place and without action this is likely to lead to a fall off in output from the reservoir with time. Capacities for flash geothermal power plants are normally between 20 and 55 MW. What does double flash geothermal? How the pressure of a steam changes in the geothermal power station?